Less than 24 hours after hosting “Strikeforce: Houston” in The Lone Star State, the San Jose, California-based promotion announced welterweight champ Nick Diaz will headline their October 9th show inside the HP Pavilion. The 27-year-old is a Brazilian jiu jitsu black belt and has won seven consecutive scraps. He is coming off an impressive 1stRound submission victory over Hayato “Mach” Sakurai at Dream.14 in May. Prior to that outing, Diaz captured the 185-pound belt with a late 3rdRound TKO of Marius Zaromskis at “Strikeforce: Miami” in January. 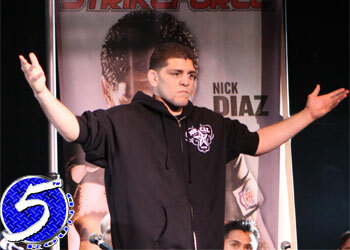 Diaz’s opponent will be named within the coming week. In addition, emerging star Luke Rockhold puts his six-fight winning streak on the line against veteran Matt Lindland in a pivotal middleweight affair. Sarah Kaufman will also face Dutch superstar Marloes Coenen in an entertaining 135-pound catfight. Rockhold owns an impressive 7-1 record and has finished six of his victims by way of submission. The 25-year-old is coming off a 1stRound TKO of Paul Bradley in February. Lindland scored a 3rdRound TKO victory over “King” Kevin Casey on May 21st in his hometown of Portland, Oregon. The former UFC star has been competing professionally in MMA since 1997. A special presale opportunity for “Strikeforce Insider” e-newsletter subscribers begins this Wednesday, August 25th at 1PM ET/10AM PT. A special presale code will be sent out to all “Strikeforce Insiders” on Tuesday, August 24th. Tickets go on sale to the general public on Saturday, August 28th at 1PM ET/10AM PT on Ticketmaster.com.